Vybz Mas’ main theme is Enchanted Gardens, designed by Atalya James with sections Starlight, Pixie Dust, Fairies and Elves. Pixie Dust is an array of beautiful pinks, aquamarine on a sequinned leotard or bikini with tiara and feathers. Fairies is a similar design, although created with beautiful shades of eye-catching greens. I managed to have a brief chat with Jodie (of the Gaga section) and Atalya (Enchanted Gardens). It’s Atalya’s first time designing for the road, and I’m sure it won’t be her last. She says she’s very excited, and has loved not being restricted with her designs. Playing mas for the first time last year inspired her to bring her designing talents to life. Jodie is a little more experienced; she’s been designing for five years and has won competitions with her costumes. Vybz Mas is a big project for her, and she says that everyone is like one big family, which has made it all the more fantastic for her. This band launch featured unique, colourful, retro costumes and hit soca tunes all night; the perfect recipe for what should, in turn, mean a perfect time on the road this year. to name a few. Last but certainly not least, we have a number of pre-judged segments like our famous Bajan Chef Queen where the delegates cook the national dish of Barbados for a panel of judges, our Heritage Quiz panel debate against the 1st and 2nd generations of Barbados and our philanthropy project, Through Their Eyes - Beauty with a Passion, which doesn’t even scratch the surface of our segments. Our queen goes on to building the platform of her choice as a brand ambassador for Barbados, taking part in the annual promotional winners trip to the island, sponsored by Barbados Marketing Inc and Intimate Kreations Ltd. You can also visit our website for more details. (www.missbarbadosuk. com) Do you struggle to get girls to compete or is it reasonably easy? We always receive a fair number of applications annually and even out of season. However, due to having a tight budget, we aim to have no more than 8 finalists each year. When the time comes and you decide to stop doing Miss Barbados UK, what would you hope to have achieved? As challenging as producing a pageant of this magnitude maybe. I definitely wouldn’t be stopping anytime soon. Miss Barbados UK has way more to offer than what we have delivered so far and we aim to keep leaving a positive mark and impact on society on the inner beauty of pageantry. Plus my kids have stated their claim in taking it over when they are grown, as Miss Barbados UK will certainly have a legacy! I would like to say thanks to Shakira for taking time out to answer our questions and we wish the best of luck to all of the contestants in this year’s competition: Tyra Morgan-Archer, Michelle-May Grazette, Tierney Fauche, Cordelia Harrison & Karyna Greenidge. ith a packed programme this year, the 63rd Antigua Carnival looks like being something special. Thatâ&#x20AC;&#x2122;s certainly the hope of the Antigua and Barbuda Tourism Authority and the National Festivals Commission, which for several months have been busy in the UK and elsewhere promoting the festivities. sive selection of mas bands to admire or play with; the largest are Beautiful People, Insane and Myst, but there are plenty of medium-sized and small bands to choose from. Antigua is not behindhand when it comes to party packages and several are available that take in the most popular events (email info@antiguacarnival.com for information about these or registering with a mas band). From the UK, inclusive deals are available, such as SN Travel’s eight- and 14-day packages including return flights and accommodation from £1,200 (www.sntravel.co.uk). Antigua Carnival has certainly come a long way since that ‘one-off’ coronation celebration in 1953! When and Where Will Your Next Carnival Be? he month of May is the start of the UK carnival season, which this year will see more than 40 active events - some traditionally English, and some Caribbeaninfluenced. Don’t know where to go, or what to do? Our events listing is all you need to keep you in the know. We cover predominately London, but whenever or wherever we hear about a soca fete or caribbean related event, we’ll list it. 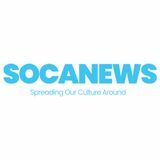 If you’re a promoter, then to ensure you get listed please send us your event details and a print copy of your flyer to events@socanews.com. For full event listings, please visit socanews.com/events. 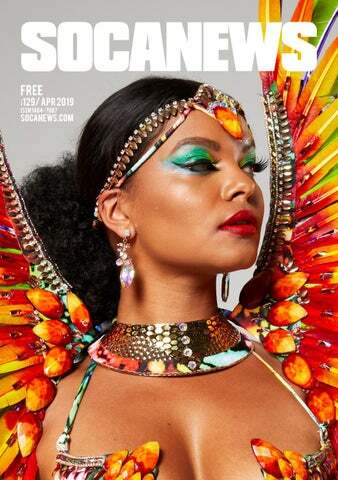 SOCA FRENZY - EASTER CARNIVAL JAM @ Scala, 275 Pentonville Road, Kings Cross, N1 9NL. Time 11pm–5am. Price £8 & £15. @ The Library Members Club, St Martins Lane, WC2N 4BD. Time 9pm–2am. Price £5, £7 & £8.80. @ The Lighthouse Bar and Club 62 Rivington Street, EC2A 3AY. Time 10pm. Price £5 & £10. @ The Tabernacle, 34-35 Powis Square, W11 2AY. Time 4pm10.30pm. Price £5 16 & under, £5 OAP, £8, £10 & £17. @ Electric Brixton, SW2 1RJ. Music By Travis World,DJ Markee & Shep Beats. Time 11pm-5am. Price £20. @ 229 The Venue, 229 Great Portland Street, W1W 5PN. DJs DJ Shakit, DJ Dee & Deep & Clarity. Time 10.30pm–3am. Price £5. @ Simmons Cocktail Bar, 105 Charterhouse Street, EC1M 6HW. Time 8pm-2am. Price Free Entry. @ SiNK Pong, 2 Paul Street, EC2A 4JH. Time 4pm-Midnight. Price £10. @ The Tabernacle, 34-35 Powis Square, W11 2AY. Time 5pm. Price £5. @ Yaa Centre, 1 Chippenham Mews, W9 2AN. Time 6pm11pm. Price £8. @ Tower Millennium Pier, EC3N 4DT. Time 2pm-6pm. Price £25 & £30. @ The Tabernacle, 34-35 Powis Square, W11 2AY. Time 7pm. Price Free Entry. @ Yaa Centre, 1 Chippenham Mews, W9 2AN. Time 5pm10pm Price Children under 15 Free, £5 adults. @ Yaa Centre, 1 Chippenham Mews, W9 2AN. Time 4pm10pm. Price Free Entry. @ Second Home, 68 Hanbury Street, E1 5JS. Time 6pm-10pm. Price £5 members, £7 non members. @ The Piano Works, 113-117 Farringdon Road, EC1R 3BX. Time 2pm-9pm. Price £10, £15 & £30. It’s time to take that well deserved getaway, in a place where you can forget about alarms and all the stresses associated with your everyday life. It’s time to take a deep breath and contemplate chillaxin’. Ahh there you go. Now that you’ve relaxed, let me tell you about one of the most idyllic islands in all the Caribbean. A place where turquoise ocean waters gently caress white sandy beaches creating the harmonious symphony of paradise’s tranquillity. Another deep breath, ahh, Grenada. After all that relaxation amid beautiful scenery, step up the pace and get your blood flowing by taking the Grenada High Wire Challenge and ziplining through one of the island’s mystical rainforests. If you prefer to have the ground closer to your feet, the Spice Isle has a range of hiking trails to suit gentle strollers and adventurous explorers alike. You can also explore the island without having to break a sweat by using a tour company to take you through rainforests, spice estates and much more. Off the land and into the sea, there are water sports and sport fishing to enjoy. With several dive operators to choose from, you have plenty of opportunities to plunge into the underwater world and explore Grenada’s Underwater Sculpture Park and dive wrecks. When visiting clubs and bars, you’ll certainly be immersed in the local music. Be warned – once you hear it, you’ll find it almost impossible not to move your body! Lose yourself in rhythmically dancing to the sounds of soca, calypso, reggae and dancehall. But of course, the best time to experience the music, especially soca in its greatest form, is during Carnival. Every August, Grenada has a chance to show off its culture and heritage through its carnival, Spicemas. It’s definitely a time to jump up and let loose but it’s also a time to embrace the history of the people. Spicemas has grown steadily over the years and today is one of those Caribbean carnivals you should definitely experience: it takes in traditional mas, in the form of Shortnee, where characters adorn themselves with face masks and brightly coloured clothing, along with more modern eye-catching mas such as bikinis, beads and feathers. This is all wrapped up by Jab Jab, something Grenada is known for and sees individuals covered in oil, chains and wearing horns. However, before you get fully into mas why not pop across to Carriacou for the Regatta Festival, which this year takes place the 2 – 5 August: it’s an ideal prelude to partying at Spicemas. Grenada’s music has long had a place on the international stage and especially so this year, when at least five Grenadian artistes reached the finals of the 2019 International Soca Monarch competition. The top prize of TT$1 million and the title of International Soca Monarch (Power) went to Mr Killa (Hollis Mapp) with Run With It. Mr Legz (Hector Thomas) placed third in the Power category with Wining Challenge while in the Groovy category V’ghn came in third with Trouble In The Morning. Congratulations Grenada! You’ve adventured, eaten, sippd and danced the night away: now it’s time to retreat to your room for a well-deserved rest. Naturally, there’s plenty of accommodation choice from home stays, small inns, spa resorts and boutique hotels to cottages and villas. You can also pick up day passes to resorts such as Laluna and Mount Edgecombe for a change of scene. If you really want to treat yourself, check in to the 2019 AAA Diamond Awardwinning hotel, Spice Island Beach Resort, or the new beachfront Silversands Grenada. Pure Grenada, the Spice of the Caribbean, is surely going to be your next stop, your next adventure, your chance to experience paradise.